REVIEW: Detective shenanigans in Signature’s ‘Cloak and Dagger’ satire. I don’t think there are any more old vaudeville and burlesque jokes that Ed Dixon didn’t find and use when he wrote the book, music and lyrics for “Cloak and Dagger,” a new musical now playing at Signature Theatre. What he found was enough for him to create a wonderfully and delightfully funny satire of the hard-boiled private eye. And it’s all there – Nick, the down-on-his-heels private detective, broke and in debt, and the gorgeous blonde in a tight red dress, who walks into his shabby office where even his furniture and phone have been repossessed. She has the pneumatic curves that even Mickey Spillane never imagined; Nick is dedicated to helping this damsel in distress. The lady has lost the Golden Venus and goes by the name of Helena Troy. When Nick makes a reference to that other Helen, it’s lost on the lovely dumb blonde. That’s just one of the many gags that Dixon indiscriminately throws around in a non-stop 90 minutes of madcap antics, with only four actors performing nearly 20 roles. Helena (Erin Driscoll) is the only female in the cast, but she more than holds her own and is more than enough for our detective, Nick Cutter (Doug Carpenter). Carpenter, a man with a golden voice, races about New York City from one cheap dive to another in his quest for the Golden Venus, which looks a lot like the Statue of Liberty. 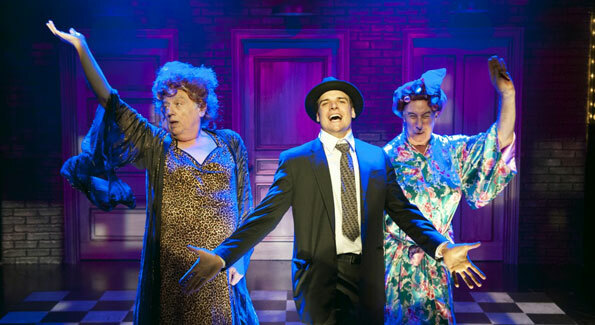 The other two members of the cast, Man One (Dixon, the multitalented creator of the musical) and Man Two (Christopher Bloch) take command of all the other roles, often in drag. Both are creatively and brilliantly funny donning wigs created by Anne Nesmith. It is evident that Eric Schaeffer was looking for a popular summer trifle when he decided to direct “Cloak and Dagger.” One of the most creative and competent directors working anywhere, Schaeffer is in complete control of the mayhem and has succeeded in producing a fun way to spend a hot summer evening. “Cloak and Dagger” has a great future in theaters all across the country, but all those future productions won’t have the delightfully talented and funny cast of this production. The 19 songs in “Cloak and Dagger,” while not especially memorable, are convenient platforms for the antics and help speed the production through the various situations that include a truly cheap burlesque house, a Chinatown joint and a spaghetti house with Italian gangsters; there’s something for every private gumshoe cliché ever used. But, once again, the situations and jokes that should produce groans, instead provoke real laughter. All the action takes place on a simple set with three doors. Designed by Daniel Conway, the rushing in and out of doors with rapid costume changes backstage is remarkably efficient in creating anticipation for the next sight gag. Kathleen Geldard’s over-the-top costumes contribute smartly to the mayhem on stage. Impressively, the four-piece orchestra under the direction of Jenny Cartney, seems bigger than it is. It just may be that Ed Dixon is on to something in digging up all those old burlesque jokes and well-worn comedy routines. At least they work smartly in this satire of Sam Spade private detectives, a literary type that may be dated and passé, but still entertaining. “Cloak and Dagger” continues through July 6, 2014, at Signature Theatre, 4200 Campbell Ave., Arlington, VA 22206. Tickets start at $40 and are available at 703-573-7328 and online here.